The World in the Satin Bag: NaPoWriMo: Who's with me? I am participating in the National Poetry Writing Month. No, this is not an April Fool's joke. I am seriously going to write one poem, every single day for all of April. That's 30 poems. And it's entirely possible I am going to post them here. John Keats = poetry boss. Worship him. If you're inclined towards poetry, you should join me. Or not. It's up to you. But this is what I'm doing this month, on top of all the other crap I have to do (final papers, grading, syllabus creation, etc.). Then you seriously need to read Hyperion. 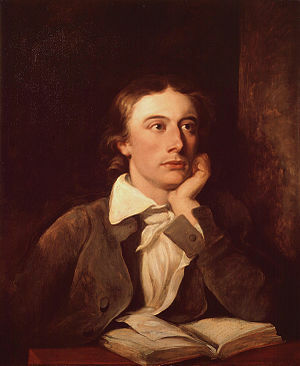 John Keats is a character in it. And yes it is a space opera. I have it. It's in my arsenal of books. I'm with you. I've been calling myself a poet since I just had my first accepted for publication. When I was in graduate school poets were as mysterious as sorcerers to me. I thought that they were these people born with this magical nature. Yet at the same time I still considered fiction writing to be harder. Now I realize that poetry is a talent that can be developed if you are willing to work hard at it.